Many exotic breeders like us, had to stop breeding these critters because finding unrelated breeding stock was nearly impossible. It is quite common for many animals in a given geographical area to all be related. The cost of bringing in new bloodlines (airline is the only legal way to ship mammals) is prohibitive to most breeders especially when compared to the typical retail value of these animals. The bouncy bushy tailed jird closely resembles a giant gerbil with a fluffy tail. It is very inquisitive and playful. The bushy tailed jird rarely bites or nips unless of course they are really scared. Jirds have been known to live up to five years in captivity but three years is the average life expectancy. Most bushy tail jirds welcome cage companions but they treat humans like part of their terrain to be explored. For this reason they hardly ever sit still and don't like to be restrained or sit still in your hand. Jirds can be found in many parts of northern Africa and southern Russia. The single species of bushy tailed jird (Sekeetamys calurus) is found in eastern Egypt, southern Israel and Jordan, and in central Saudi Arabia. Adult jirds are of 3-5 inches in length and weigh an average of 1-3 ounces. The jirds gestation is 24-30 days and they can have 1-6 babies per litter. Our jirds average about 3 babies per litter. Babies are weaned at 20-30 days. Our jirds averaged only 5 litters per lifetime. We prefered to breed our jirds in pairs but others have had success with one male and multiple females. We fed our jirds a mouse/gerbil mixture supplemented with fruits and vegetables. Our jirds seem to enjoy apples, carrots, sweet potatoes and salad greens. We occasionally give them rodent block to add variety to their diet. They enjoy gnawing materials such as twigs from untreated willow, birch or apple trees. Crickets and mealworms can also be offered as treats. Water bottles with a protective metal covering work best since the jirds tend to chew exposed plastic on water bottles. Ceramic or stoneware food dishes can be used, but the jirds will often dump out their food or cover it up with their bedding. Since jirds like to jump, bounce, and play we recommend keeping them in a 10 gallon or larger aquarium. 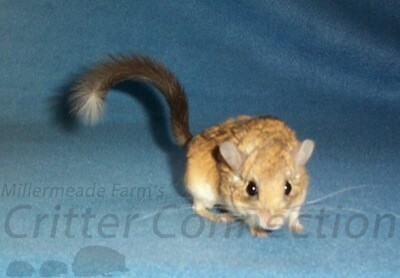 Since jirds are about twice as big as a gerbil, they need about twice the amount of space appropriate for a gerbil. Plastic cages and accessories are not appropriate for jirds since they chew everything! The bushy tail jird does not have strong scent glands or an offensive smell. It has small pelleted droppings which make cage cleaning very easy but we doubt they can be litter box trained.